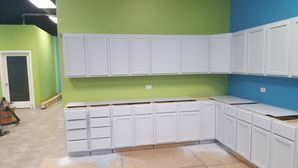 Cabinet painting in Woodridge Illinois is an inexpensive way to give your space a brand new look! The Woodridge cabinet painting experts use the highest quality paint and the most modern colors to give your kitchen or bathroom an amazing transformation. Whether you’re looking for a vibrant splash of color or a subtle change, Painter's Logic specializes in Woodridge cabinet painting. Did you know that using a semi-gloss finish will not only give your Woodridge cabinets a richer look, but also makes it really easy to clean? Painter's Logic will work with you to match colors and textures to ensure the finished product is better than expected. Providing superior cabinet painting in Woodridge since 1980, Painter's Logic has the expertise to instantly increase the value of your investment. On average, painting your Woodridge cabinets in a small-to-average size kitchen costs approximately $5,000-6,500. Full replacement of the same size would cost between $15,000-30,000. And in many cases, replacement costs could be greater than that as people tend to replace countertops in the process, leading to electrical and plumbing work. Why spend more than triple the cost by replacing? You can have a beautiful, newly updated-looking kitchen by painting your cabinets in Woodridge! No more outdated bathroom cabinets or boring kitchen cabinets. Call (630) 296-9280 for a free quote on cabinet painting in Woodridge. 5★★★★★ - "Bob did an amazing job painting the kitchen and bath cabinets in my new house! He worked fast, efficient and clean! I have a new kitchen for a fraction of the price of new cabinetry!!" 5★★★★★ - "Robert did a fantastic job painting our kitchen cabinets. His price quote was very reasonable and his work was very professional. He handled the entire project himself and all the work was completed with an expert’s touch. He even fixed some previous imperfections on the cabinets and doors. I would hire him again if we ever needed any more painting work done"
5★★★★★ - "Great job at a great price"
5★★★★★ - "Robert did an amazing job on our complete interior painting project! 10 stars!" 5★★★★★ - "We were very pleased with Bob from start to finish. We just bought a new house that needed a total interior paint job. Bob was very helpful in the process. He advised on painting techniques and used his industry expertise to help us choose paint colors. I feel he went above and beyond what I was expecting. He even met with us and the flooding people to work with everyone's schedules. Our home looks great and the paint job he did to our fireplace is beautiful. 5 of 5 from me, would hire again." 5★★★★★ - "The company quoted competitively. Arrived on time and finished earlier than expected. Perfectionist and made sure the job was completed fully with detail and over delivered. We were so happy that we got a quote for another job and This was finished quickly as well." 5★★★★★ - "The job was done on time and exactly to my specifications. I would highly recommend this person to anyone." 5★★★★★ - "Robert transformed our 20+-year-old colonial staircase into a modern masterpiece. The cleanliness and precision of his work are like no other and the final results are an amazing reflection of his many years of knowledge & expertise. We highly recommend him for all of your painting needs!" 5★★★★★ - "Robert was a pleasure to work with and did a great job! Very reliable and very particular about his work. He also took care to make sure my home stayed clean during the process! Would definitely use him again!" 5★★★★★ - "Robert did an excellent job painting the cedar and windows of our house, and our large pergola. His price was very competitive and his work quality was superb. He used a spray technique on most of the house and pergola. The spray technique does use a little more paint than the normal brush-type style painting, but the spraying gave us 2 to 3 coats of new paint on the house, and when using the spray technique, Robert was able to get into all of the hard to reach area that brushing does not get to well. He covered all of our shrubs, trees, and outdoor furniture, and sprayed and rolled and brushed painted all of the areas we needed painted. He used a California-cut type style on the corners and painted the trim and gutters around the windows. The gutters now look brand new. His prep-work was also excellent as he sanded, caulked and taped or covered (with plastic) appropriate parts of our home. Overall 10 out of 10 stars"
4★★★★☆ - "Robert was on time, finished quickly and the walls look great!" 5★★★★★ - "Robert did a great job. He was neat and quick. A true professional." 5★★★★★ - "Robert did an excellent job painting the first floor of my home." 5★★★★★ - "Best painting company very service oriented. On time actually finished ahead of schedule. My kitchen and bedrooms look awesome." 5★★★★★ - "Robert did a great job painting our home. Friendly guy and he worked very efficiently. We really appreciated him working around our busy schedules." 5★★★★★ - "We called two different painting companies to fix stair rails we attempted to do ourselves, and felt most comfortable with Robert. We were hopeful he would be able to fix the mistake we made in attempting it ourselves. With over 100 balusters to stain and paint, he did an impeccable job!! There isn’t a single imperfection. I am SO glad we chose him over another company." 5★★★★★ - "Robert was a delight to work with.His price was less than other contractors and the job he did is amazing.Well done." 5★★★★★ - "Robert was great to work with, he did an phenomenal job. He is an expert at his craft, we will definitely use him again." 5★★★★★ - "Bob did a wonderful job painting the interior of my house. He also removed a wall to open up my kitchen." 5★★★★★ - "Excellent work! Meticulous, efficient, and friendly! I will definitely be calling Robert for our next project!" 5★★★★★ - "Meticulous, efficient, and so friendly! I am ecstatic with the way my house exterior turned out! I will be calling Robert for our next project for sure!" 5★★★★★ - "Robert has done a couple of my repainting projects over the years and has always done an outstanding job. I am very pleased with the quality of his work and professionalism. He is always my first choice when I need a project done." 5★★★★★ - "Huge shout out to Bob. He is reasonable and affordable. I am very bad at writing reviews, but I decided to take some time and give this awesome guy a review. He is an awesome guy and perfectionist. He not only did the interior painting job for an affordable price, but also fixed lots of stuff, at no cost... He is like one man army, did not give up even when he had no help. He came all by himself and completed the job even before the estimated time. I would totally recommend Bob!!!!" 4★★★★☆ - "Finished work on time"
5★★★★★ - "Robert quoted a reasonable price for interior painting and started the same week. Good communication. Not a drop of paint on the baseboards. Wall repairs undetectable. Uniform finish with no lap marks. Satisfied with finished product." 5★★★★★ - "BOB IS THE GREAT PAINTER, GOOD PRICES AND GREAT WORK, HIGHLY RECOMMEND!" 5★★★★★ - "Great job! Very professional and on time! Will be using Robert again soon." 5★★★★★ - "I wish I could give 10 stars!! Robert did a fantastic job from start to finish. Robert was a pleasure to work with. He responded to my quote request right away. Robert came out and walked the property the same day right after finishing another job. He was so professional and knowledgeable that we agreed to the contract the next day. There was absolutely no pressure and no upselling. He actually even included the garage door into the price so that when the exterior paint was complete it would look consistent and clean. I cannot express how happy we are with the finished job - when you spend a good amount of money, you want to feel like you got your money's worth and we absolutely do. I recommend them 100%." 5★★★★★ - "He painted 2 bedroom and a bathroom ceiling. A job well done. I am going to use him again to paint my kitchen which he is professional. Do hire him, great prices. Don't wait to long, he might be booked." 5★★★★★ - "Did a great job and fast"
5★★★★★ - "Robert did an excellent job at our home, his depth of knowledge and professionalism definitely showed in the final product. He was easy to work with and was able to start and finish the work in a very timely manner. I have recommended his work to several of my neighbors who are considering future projects." 5★★★★★ - "Robert is a complete professional. He offered suggestions and used his expert advice to help us. I would absolutely use Roberts skills." 5★★★★★ - "Quality of the painting is outstanding. Very detail oriented. Would definitely hire Robert for my next painting job. Shows up on time and trustworthy." 5★★★★★ - "Robert gave us a good quote and he started painting our house within a week. He was easy to work with and we were very satisfied with his work."